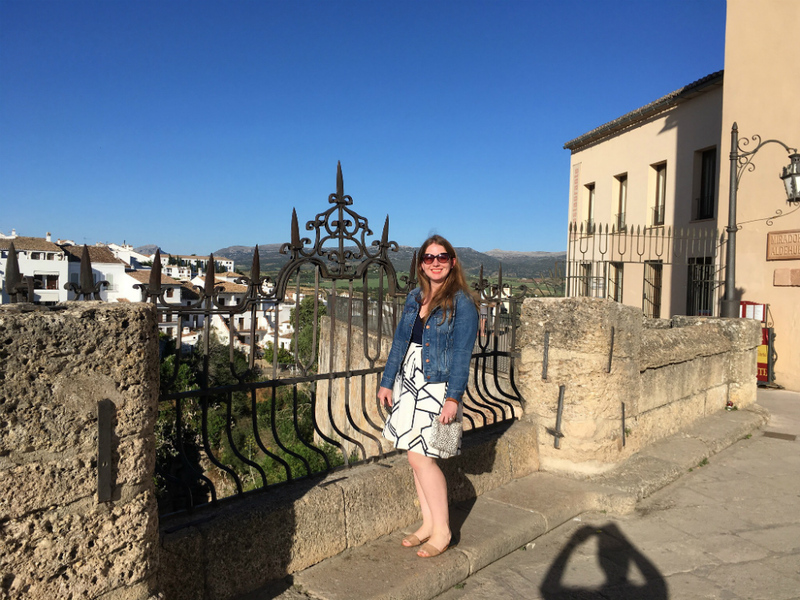 The small town of Ronda in Andalusia was my favorite destination in Spain. 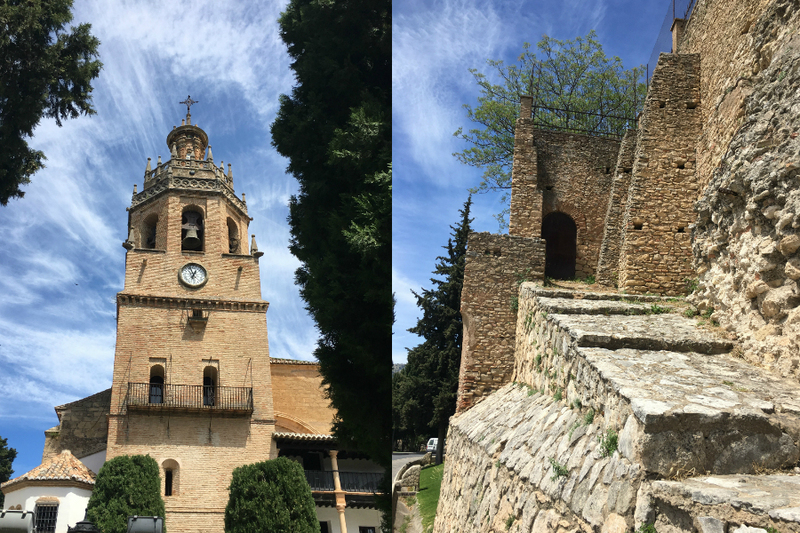 It’s the kind of town that makes the tour bus schedule as a photo op and lunch spot, but I found Ronda to be well worth a two-day stay. Reason 1: You will need at least a full day to explore everything this gorgeous city on a hill has to offer. 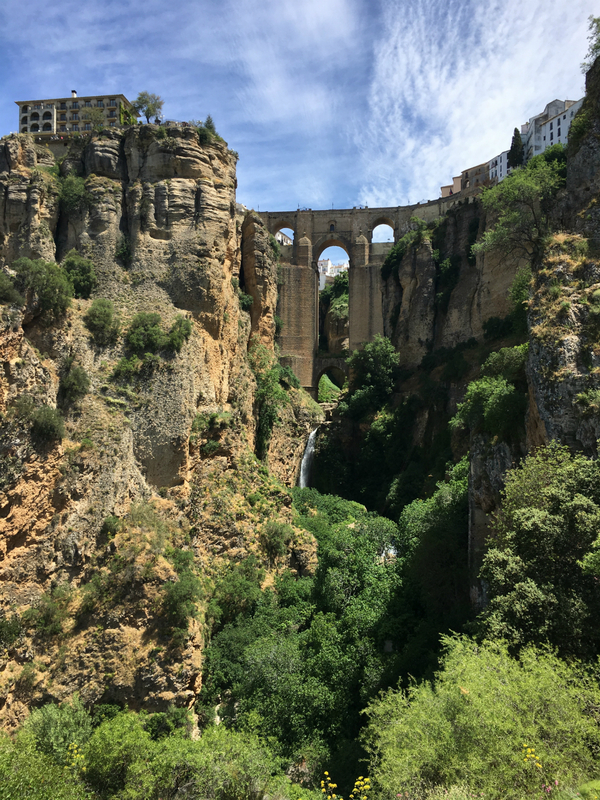 Ronda has a completely unique geography; the city is built atop a hill and a deep gorge bisects it into an older historic center and a newer (emphasis on the “er”—it’s still like hundreds of years old) section bustling with restaurants and shops. The sections are connected by two spectacular bridges, which are a draw in and of themselves. 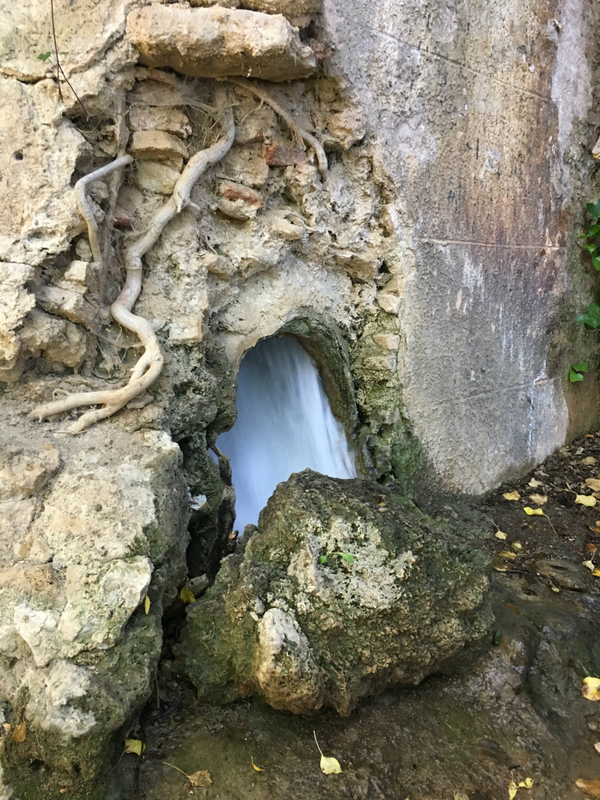 The New Bridge, or Puente Nuevo, looks torn straight from the pages of a fantasy novel, with towering stone supports and a waterfall cascading through it. 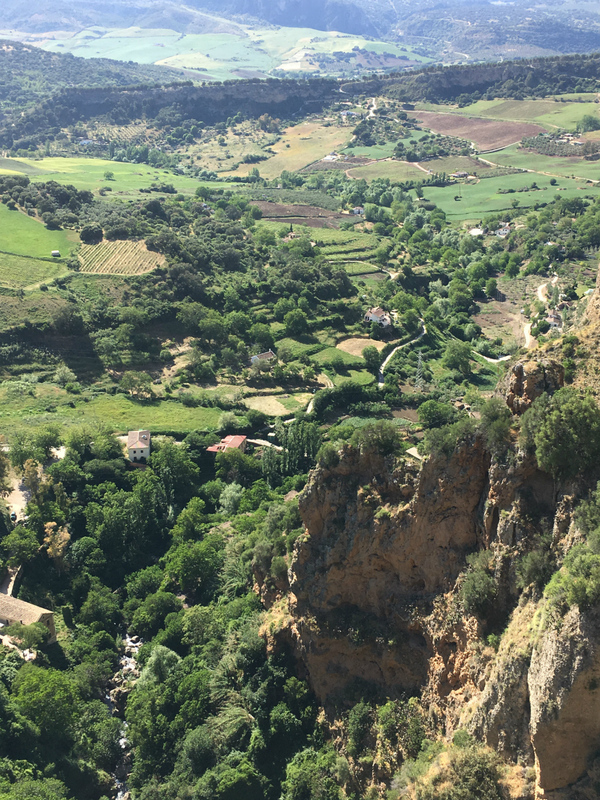 If that doesn’t convince you to add Ronda to your itinerary, I don’t know what will. 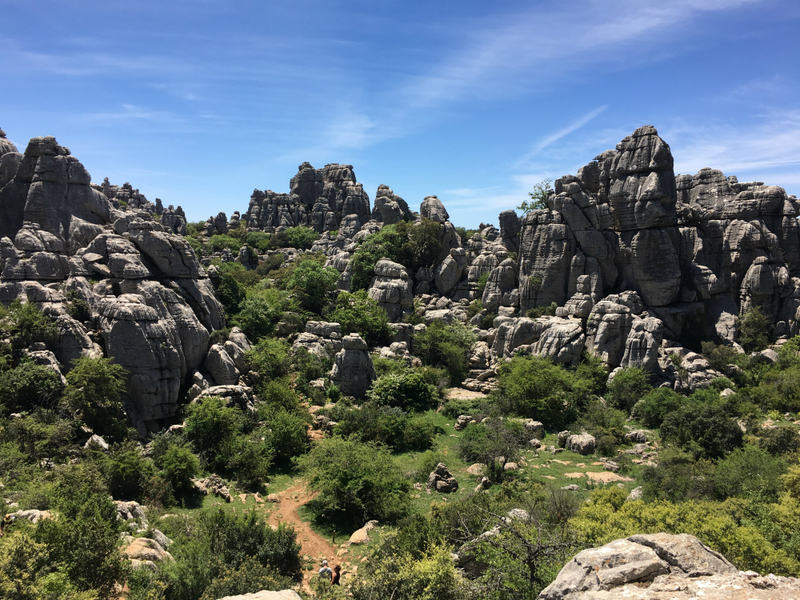 So here is our Ronda travel guide! 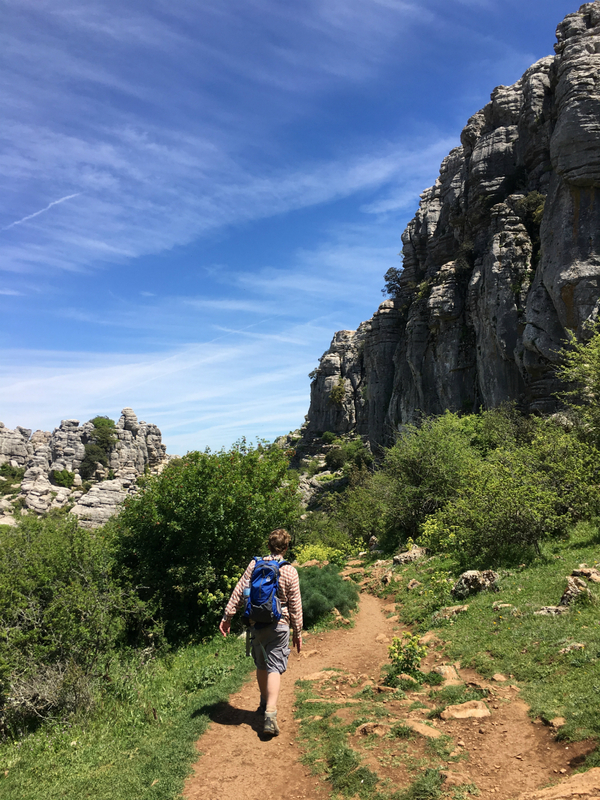 This portion of our trip was a nice change from our urban explorations, as we spent the majority of our time hiking the Spanish countryside. 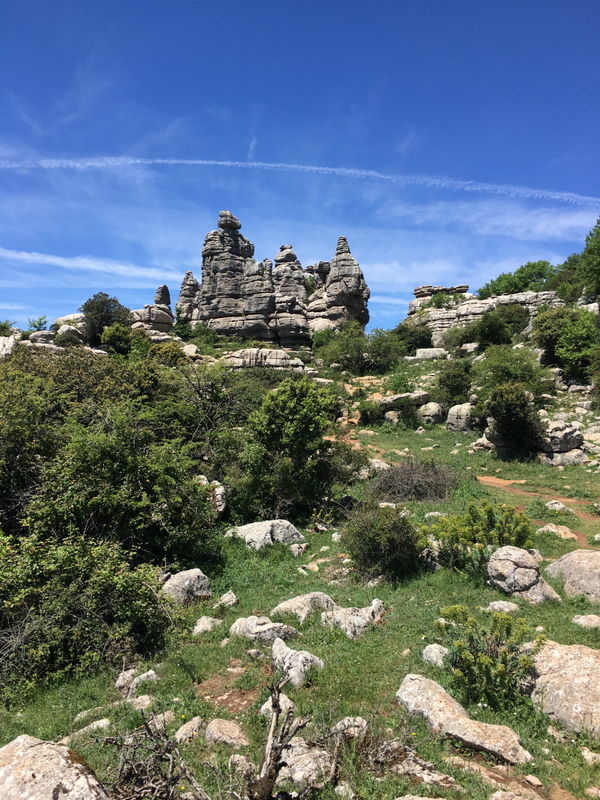 We drove our rental car from Cordoba to Ronda, but along the way we made a stop at El Torcal de Antequera, a beautiful nature reserve known for its stunning and unique rock formations. It was actually listed as one of the New York TImes’s 52 Places To Go in 2017. The winding drive will take you up a mountainside to a parking area and visitors center. From there, you can choose one of two loop routes. The green trail is shorter at just about a mile and should take about 45 minutes to hike. We chose the longer yellow route, which is approximately 2 miles and takes about two hours to hike. 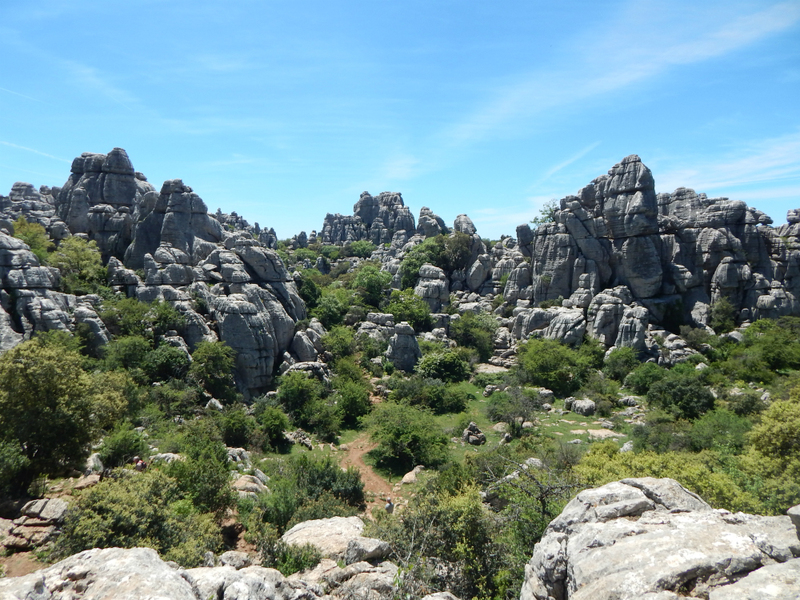 The trail is winding and rocky, so you’ll definitely want to wear good hiking shoes. 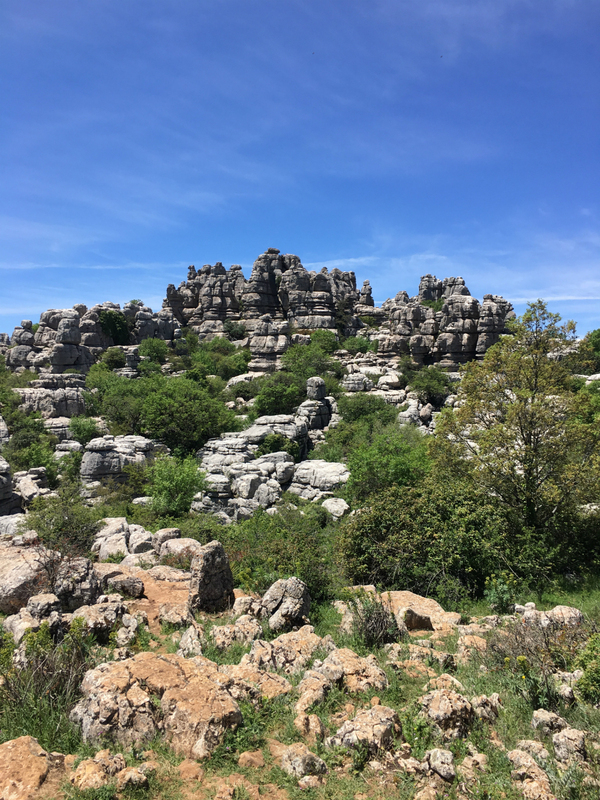 The vistas throughout are spectacular, meandering along rocky ridges and through valleys surrounded by stone formations that reminded me of drip sand castles. 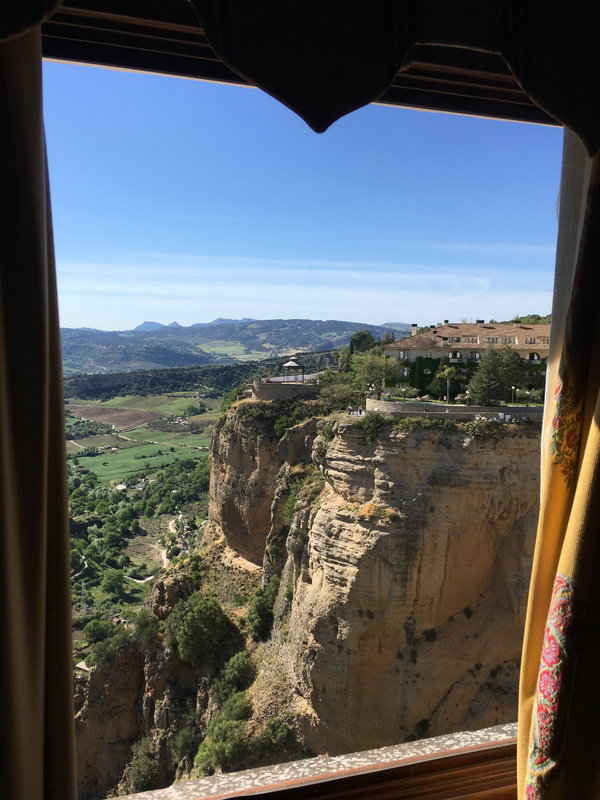 After our hike at El Torcal, we finished our drive to Ronda and checked into Hotel Montelirio. 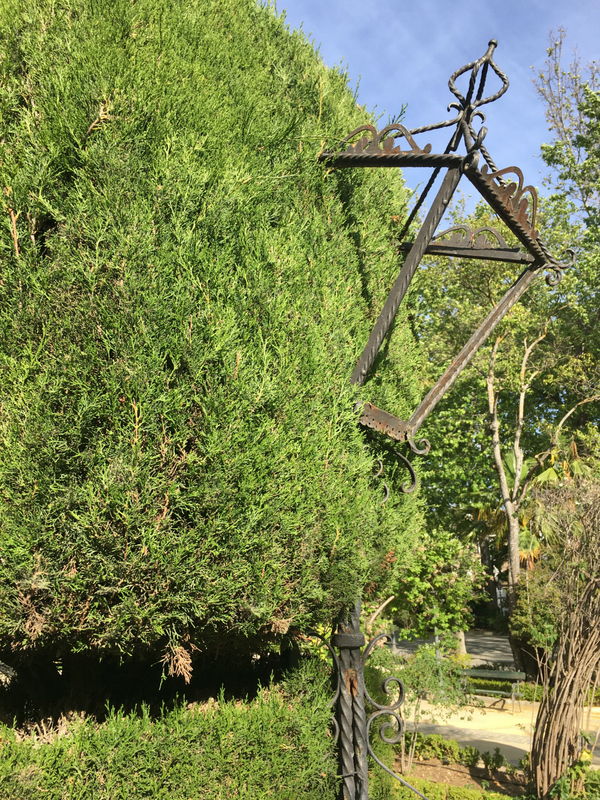 This was the first hotel I booked for our trip because it is one of the only hotels located right along the plateau’s edge with a view of the Puente Nuevo and the surrounding mountains. We booked a room with a view and it absolutely took my breath away. I would give the hotel 5 out of 5 stars. 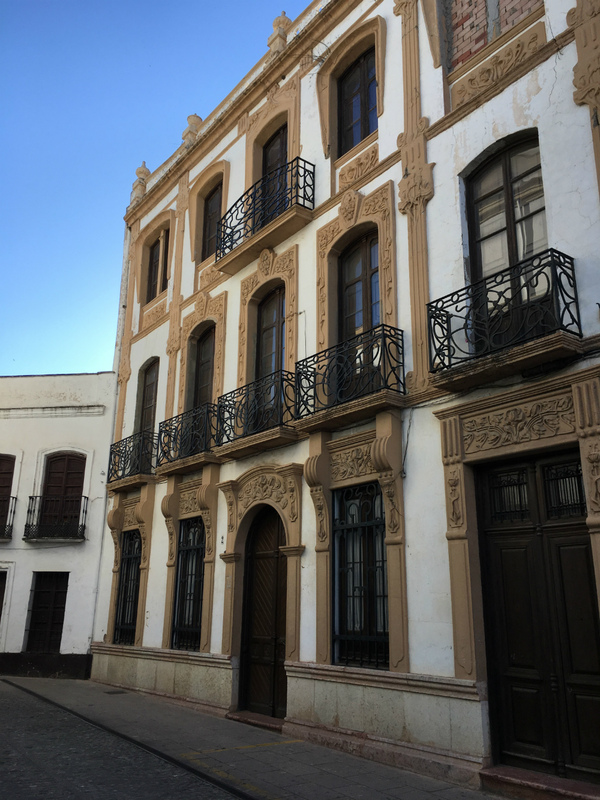 It’s centrally located off a charming side street and the building itself is beautiful and well maintained, with sweeping marble staircases, a stained glass front door and rich woodwork throughout. Each room is named after a city and decorated in kind—we stayed in the Marrakesh room, which featured wooden screens and a yellow and blue canopy dotted with stars. My only critique is that the wood screen door to the bathroom left a little privacy to be desired…I may be married now, but I still like some alone time in the bathroom, please. But in all seriousness, we loved this hotel. The staff was so friendly and accommodating and the location is unbeatable. Hi, I live here now. 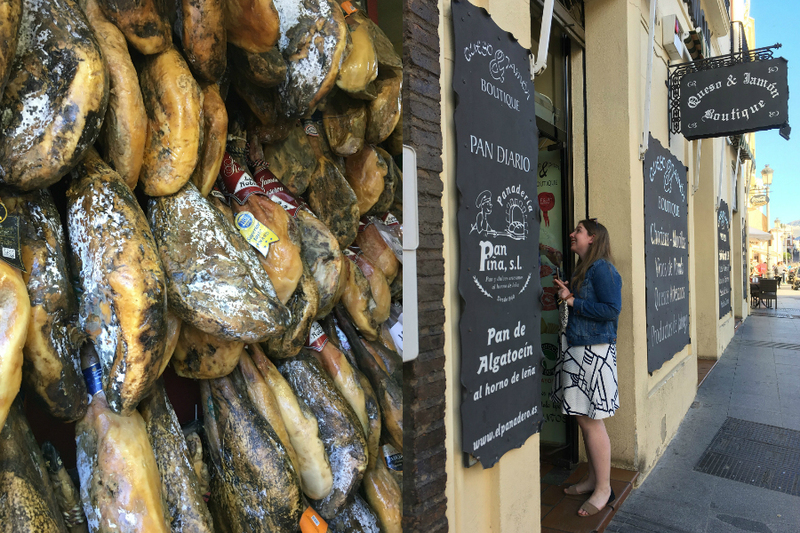 Ronda is the kind of city with a surprise around every turn. 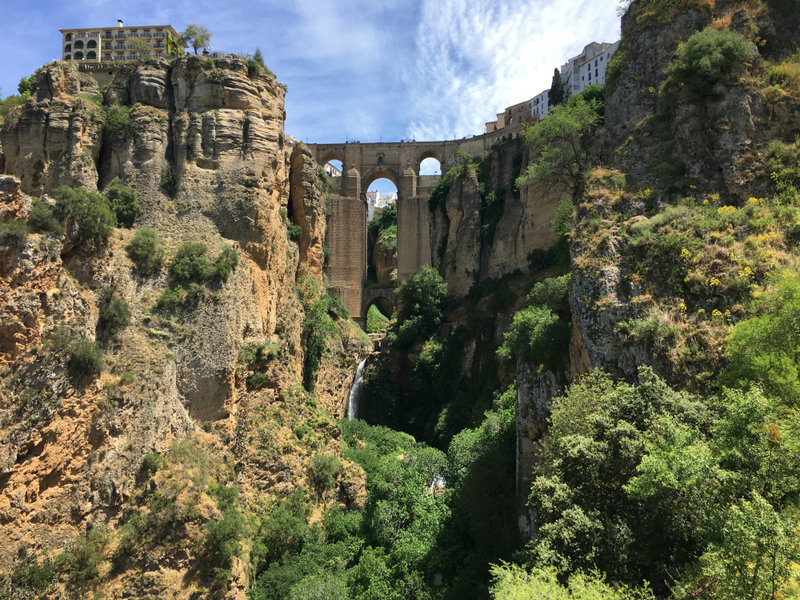 We decided to walk through the old section of the city to get to the base of the gorge (called el Tajo) for the best view of the Puente Nuevo or New Bridge. 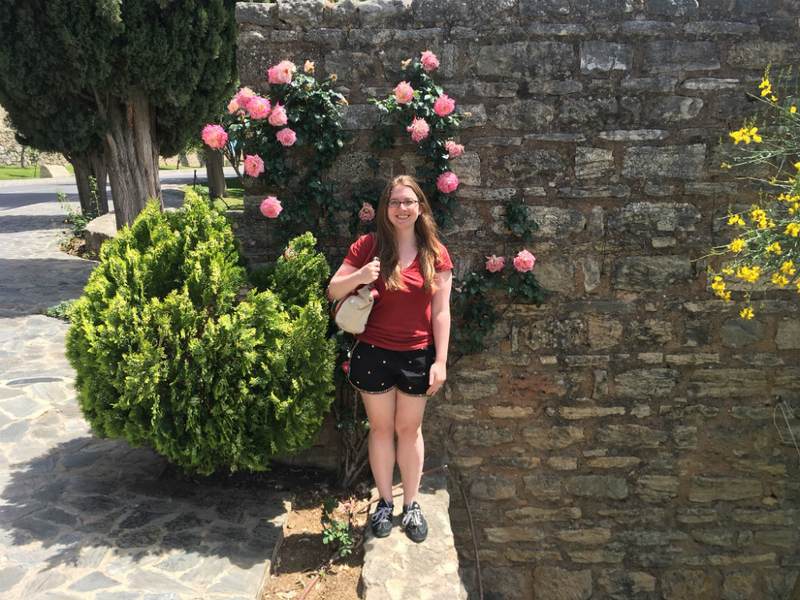 Along the way, we saw the old city walls, beautiful stone churches, charming houses and cobbled squares. 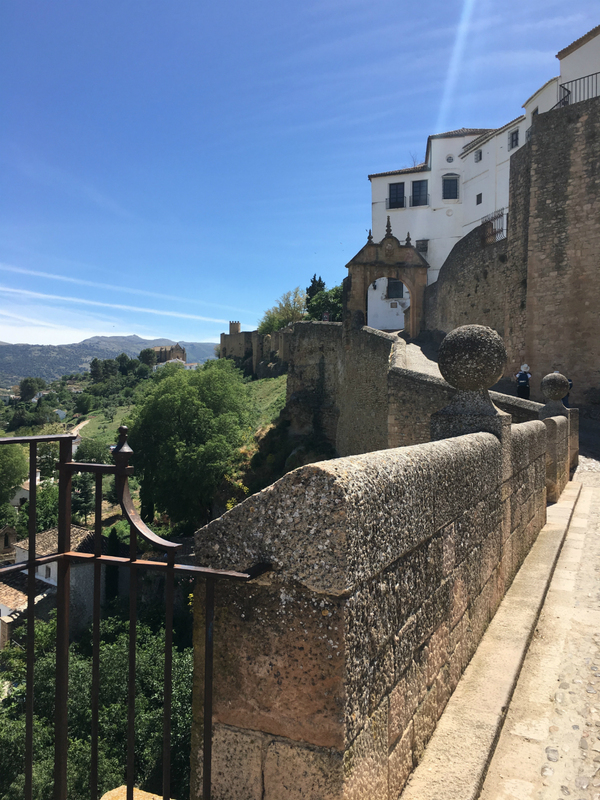 Once we left the city walls behind, we hiked a short way down a rural lane past a horse farm, and then up to a viewpoint called the Arco del Cristo, with spectacular views of the city of Ronda and the Puente Nuevo bridge. There are some more advanced hikes that you can do to get closer to the bridge and the waterfall streaming through the gorge. 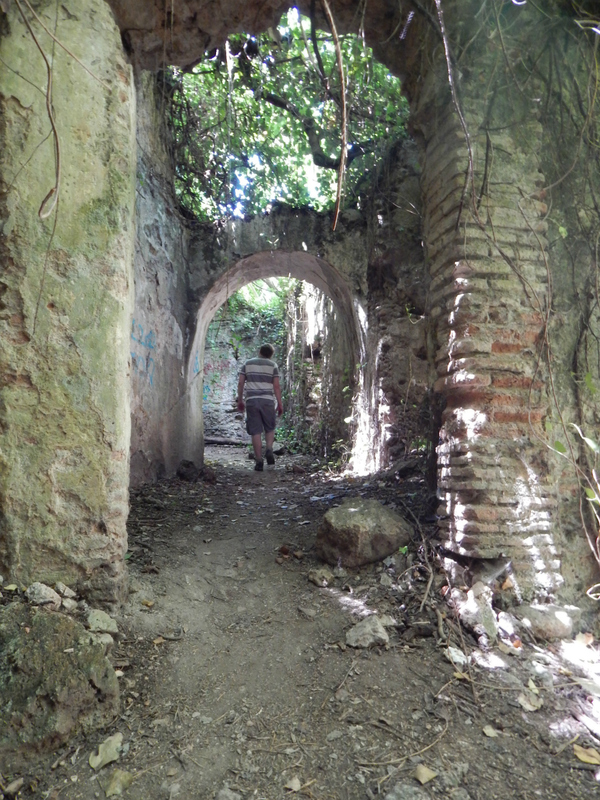 We did a portion of one that took us past some interesting ruins and a fast-flowing stream. Unfortunately, we weren’t prepared for the difficulty level of the hike. We hit a section that required you to lower yourself down onto a narrow wooden board and walk across it, and Andrew and I were worried about the stability of the board, and our ability to get back up without any equipment. It was frustrating because we could literally see a mountain pool just beyond the board that you could swim in…but it would have been too dangerous to attempt on our own, especially since we didn’t see any other hikers on the path. But you can do a short portion of the hike with just good walking shoes. No matter where you decide to walk, you will be guaranteed gorgeous views. After a little rest, we headed to the opposite side of the Puente Nuevo bridge to explore a bit of the new city. 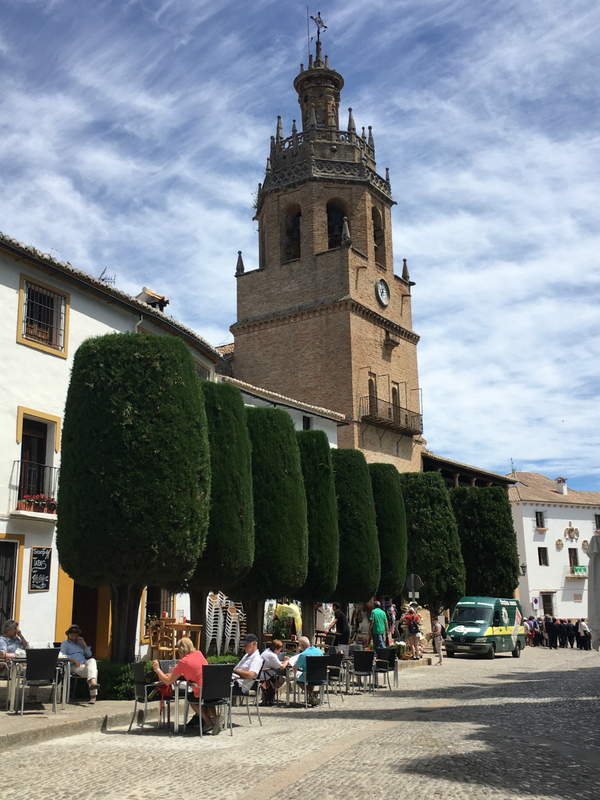 This side of the city has more shops and restaurants, but also quaint squares filled with people enjoying an afternoon drink. 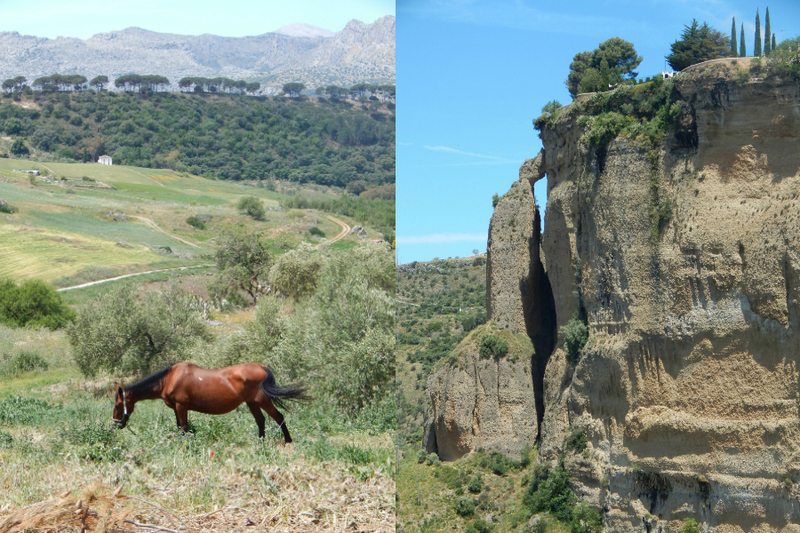 We found a lovely park with a promenade right along the cliffside, with stunning views of the surrounding countryside. 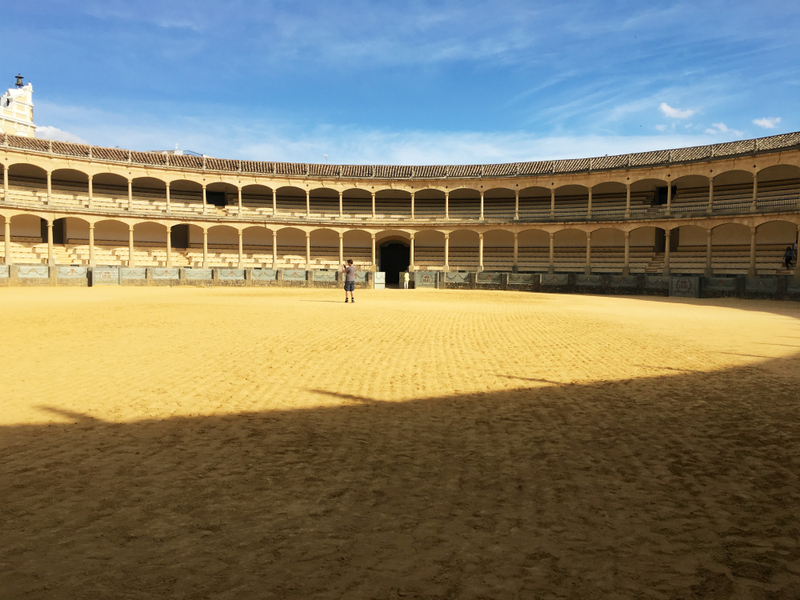 We also decided to stop for a visit at Ronda’s Plaza de Toros, or Bullring. 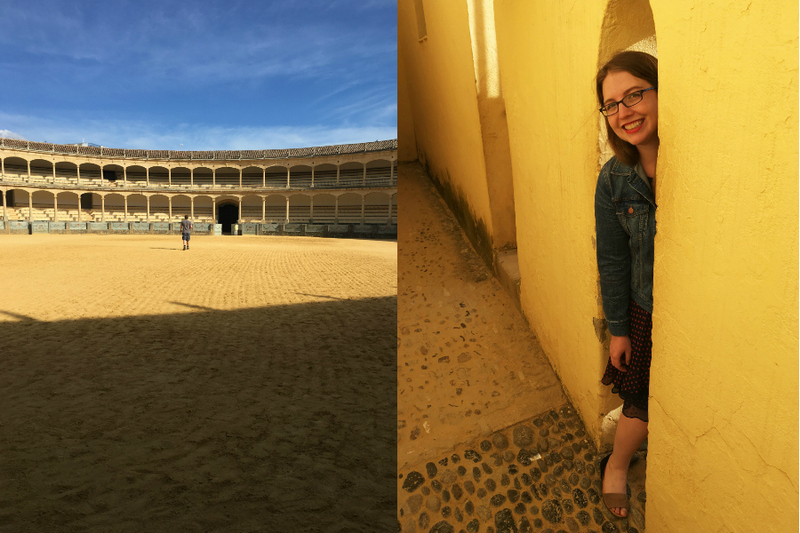 There was not actually a bull fight going on there…in fact, I wouldn’t have wanted to visit if there was. 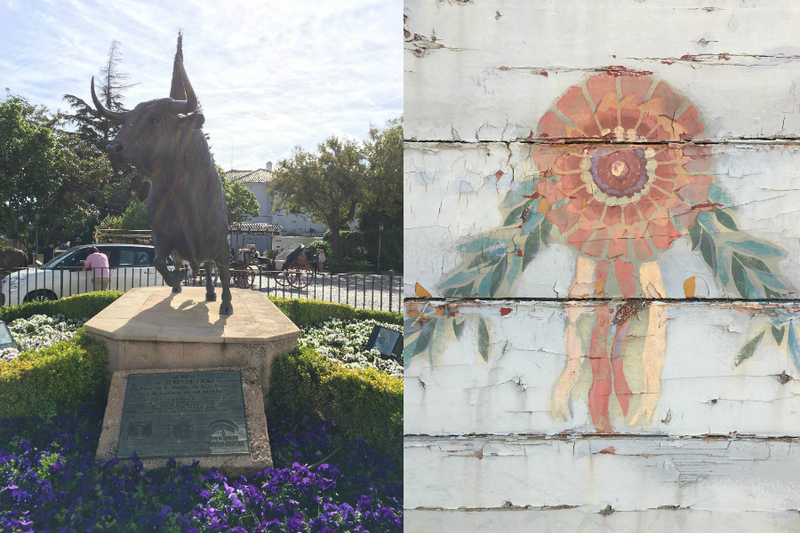 But they have a bullfighting museum and we decided it was worth taking a peek since we were right there. I thought the entrance fee was much too high for what it was though and wouldn’t recommend this as a must-see in Ronda unless you’re really interested in bull fighting. 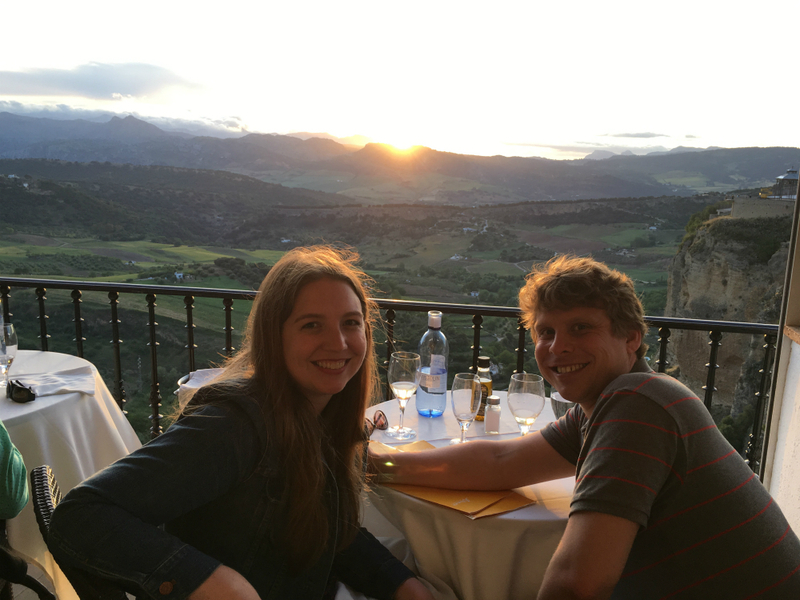 For our last dinner in Ronda, we made a reservation at the restaurant at our hotel, which is called the Albacara Restaurant, because it is seriously the best view in the city. 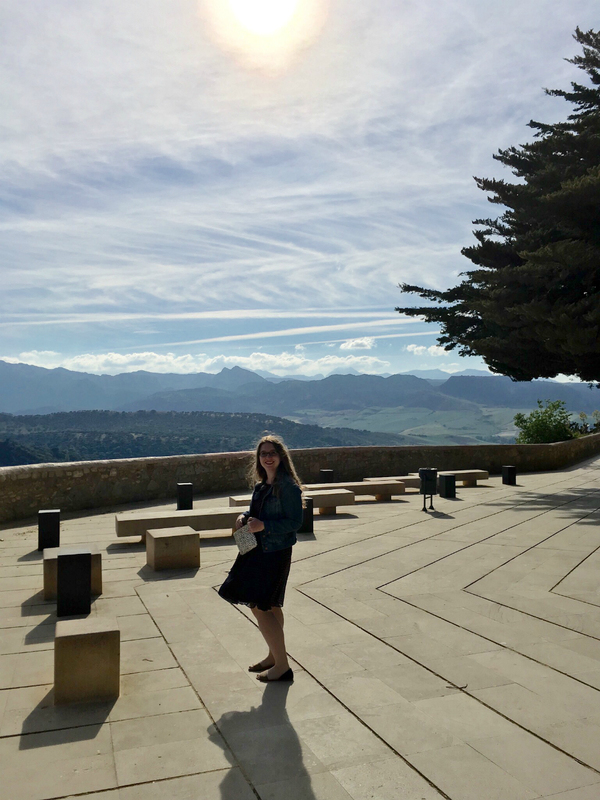 Their terrace looks out over the cliff and all the surrounding country, and faces west so you can watch the sun set over the mountains. They only have about 8 tables on the terrace though, so a reservation is a must. The food was also superb. We shared an appetizer of crab in puff pastry, and then I had a salmon roulade for dinner while Andrew had a giant leg of lamb. 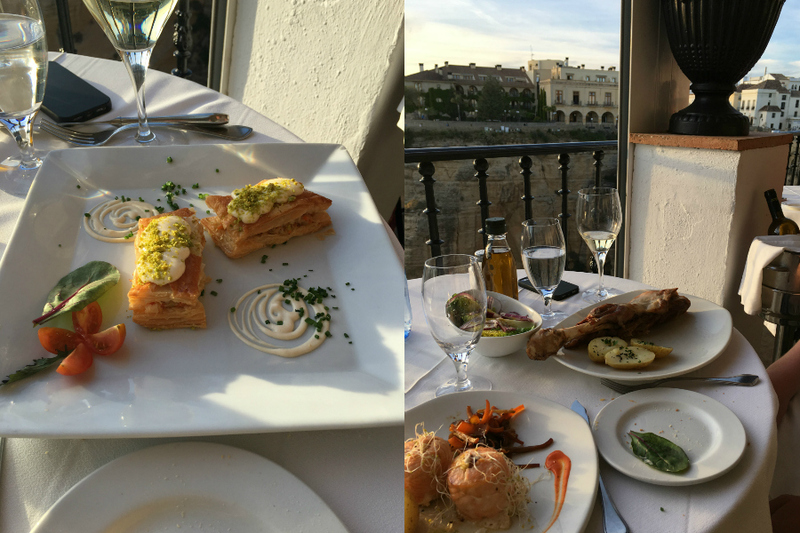 If you are looking for a super romantic dinner, this is it. 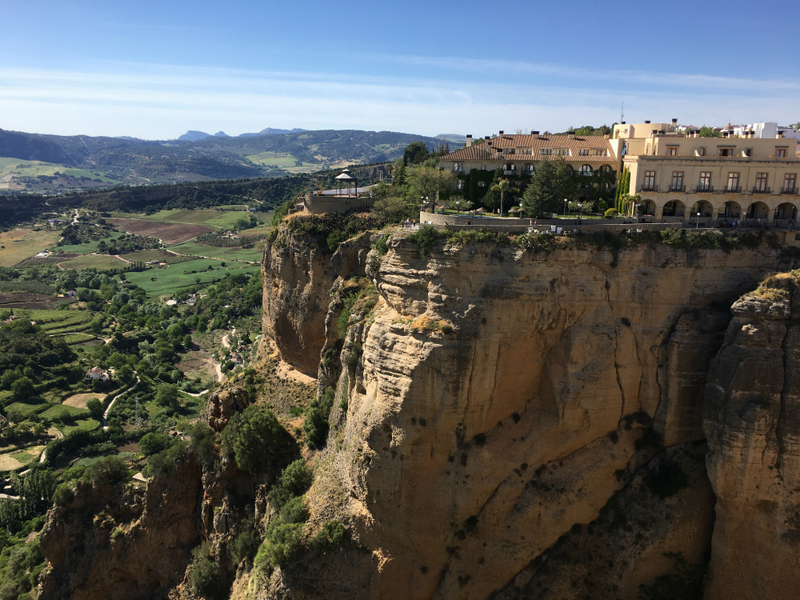 A must-do in Ronda!